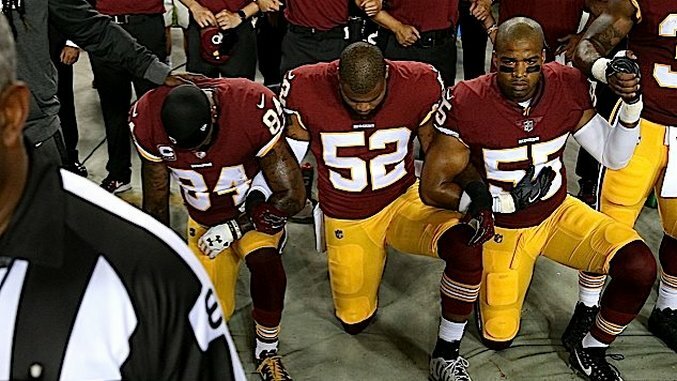 A Black Football Player Got Kicked Off His Team for Kneeling, and These White Facebook Commenters Are Lovin' It! From ESPN comes the story of Gyree Durante, a D-3 football player at Reading, PA’s Albright College. Well, make that “former player”—Durante, the backup QB, took a knee during the national anthem last weekend, and was summarily kicked off the team. This seems like another one of those “let’s change the entire meaning of the protest from ‘racial justice’ to the vague ideal of ‘unity,’ and also kneel at a different time so nobody is offended” moves, which is kinda like what Jerry Jones did two weekends ago before threatening to fire any player who continued to protest. In other words, according to me, it’s a watered-down, pointless act designed to subtly undermine the original spirit of activism with the ultimate goal of diluting it entirely. “At some point in life, there’s going to be a time when you’ve got to take a stand,” Durante told NBC 10 in Philadelphia. “For me, it just happened to be on Saturday afternoon. For the price of standing up for his beliefs and daring to buck the trend of “doing what he was told,” Durante lost his place on the team. You can decide for yourself how you feel about that. 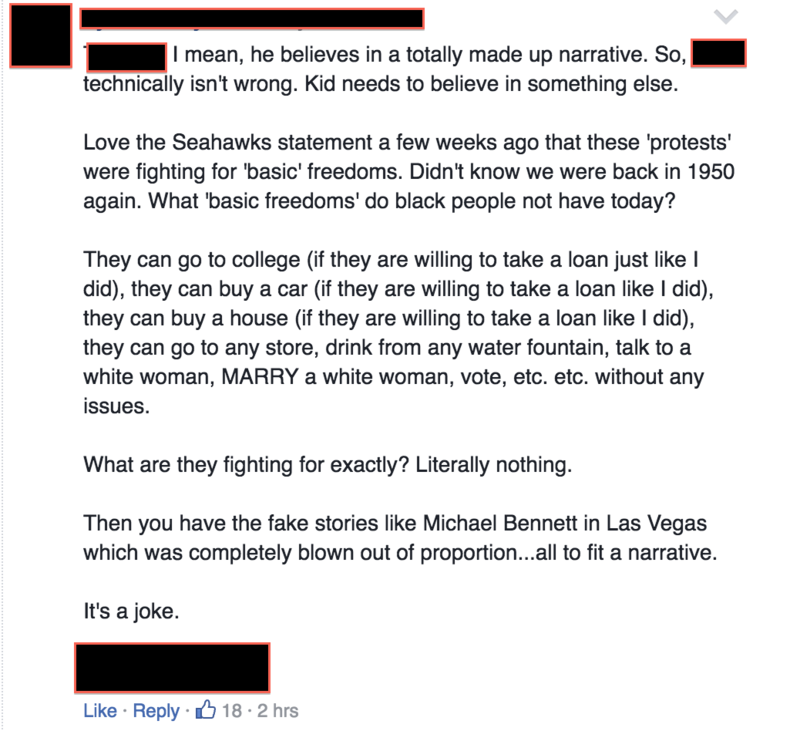 As for the white male Facebook commenters chiming in on the ESPN story? They were absolutely loving it! Below, you’ll find a fun sampling of their input, names and faces redacted. Normally I like to get to Hitler gradually, but what the hell, let’s jump right into the Nazi comparisons! How about a few insults for the guy who got kicked off his team? Good point here: Why isn’t this guy more grateful that miscegenation is legal? What if instead of protesting, he did the thing I want him to do? And finally, let’s not miss the real point here—this is a cause for celebration! To be fair to the broader readership base, not every single comment bashed Durante. Some of the supportive notes even had a few likes. But let me tell you—most of them were pretty bad, and the ones I’ve listed here were just the tip of the iceberg. By the time you visit the page, there will undoubtedly be more. This is the state of our discourse today…hope you enjoyed the ride.